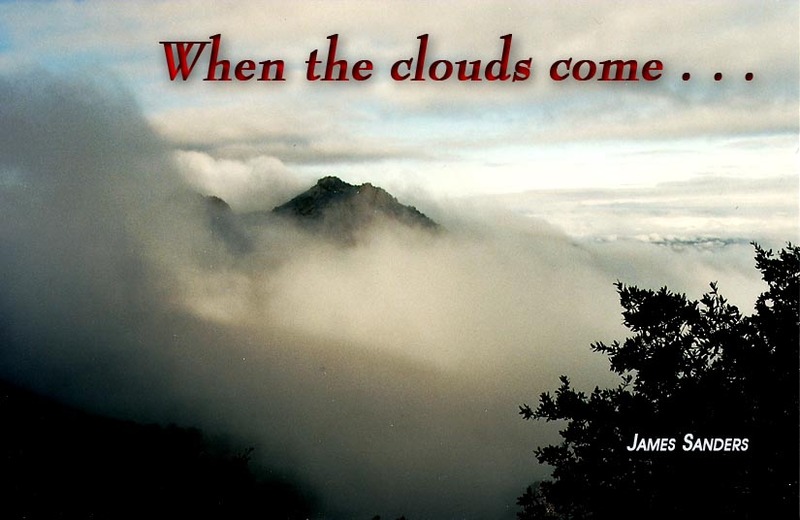 When the clouds come . . . WHEN life comes crumbing in on all sides, we often find ourselves bereft of answers. We may blame others. We may blame ourselves. We may even blame God, but nothing we can do, or any blame we scream can bring a dead child back to us. The door is closed. We all know the feeling, even those of us who never had to bury a son or a daughter. Our inscrutable misfortune may have been something as common as the loss of a job, or as common as the rejection by someone we trusted and loved. Divorce can be crushing, especially for the one who did not want the marriage to fail. None of us want to be told that we were not good enough. There are those moments when the dark clouds come upon us and regret fills our memories of a past we wish had never happened. And it may well be that even if the past were something we could live once again, we still could not change the outcome. We want to believe that if we had treated our husband better, he would not have gone with the other woman. We desperately want to believe that. And, yet, we know, within the windmills of our heart we know, that our failings or even our mistakes are not what caused the tragedy that over-ran our life. A family restaurant may close its doors for no other reason other than people decided to go elsewhere. A mother’s children may neglect her because their lives are now busy and full. The intent was never to make their mother feel bad, but that was the result. We all have had such moments, or we have seen such moments in other people. We would like to believe that the pulverizing moments in life must have an answer. Or, at least, we should never have any significant reverses and misfortunes. Success means constantly doing better, and if we live a godly life, God will bless us. Our life may have temporary setbacks, but nothing that could ever be permanently negative. What we forget, though, is that God blesses us both in the good times and in the bad times. Indeed, if we pause to think about our soul, the bad times are some of the best times we could ever experience. We may want sunshine, but we cannot get to God without the dark clouds. Doth Job fear God for nought? It was here, in a dense and enveloping darkness that God spoke to Moses. The scene is one of terror and uncertainty. The phrase, thick darkness, suggests that Moses may not have been able to see where he was walking, or perhaps even to see his own hand in front of his face. Apparently, sheer darkness swallowed him on every side. In such a setting, Moses encountered God. If we seem hesitant in describing what happened, it is because the details themselves are deliberately hidden in this narrative. What is not hidden, though, is that God and darkness merged. In a similar way, I find God in the dark moments of my own life. Acceptance of our lot in life is the point that we do not want to overlook. Paul had experienced both abundance and need (Philippians 4:11, 12). In both, he had learned contentment. We, however, at times are far too preoccupied because our job is less than ideal; our boss, far too demanding and unreasonable. Our life is miserable because we find ourselves in a bad marriage, or live across from irritating neighbors. We are miserable, and we add to our misery because we desperately want life to be different. Of course, it is not wrong for any of us to want a better life. As for a bad marriage, even the Scripture tells us that living in a wilderness is a better option than living with a carping and bitter woman (Proverbs 21:11). Sometimes, however, escape is the only choice we may have, but it is an undeniable truth that we are the closest to God when we are the most desperate, and the farthest from God when we believe our life is care-free and filled with potential. My awareness of God is with me most when my problems are the worse: “though I walk through the valley of the shadow of death . . . thou art with me.” When life becomes fragmented, the Lord stands at the door of the soul and knocks. I cannot tell you, of course, what God would want you to do in an impossible situation any more than you could tell me what I must do should a physician say that I have terminal cancer. Such moments belong to the inner heart of a man and the God who made him. What we can say, however, is that our life, and an inexplicable darkness, and God are all intertwined. What we can say is that in what may seem like an unbearable circumstance, God would have me learn about godliness. Should you or I find ourselves depressed, despondent, or filled with anxiety, we need to look up as well as within.